Airbnb has added Ashton Kutcher — comedic heartthrob, coveted angel investor and Twitter-master extraordinaire — to its team of investors, the San Francisco based startup has announced in a blog post. 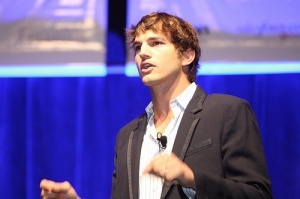 The company isn’t sharing the size of the check, but says it represents Kutcher’s biggest venture investment to date. And while his investment probably isn’t eye popping, Kutcher is nevertheless a big get for Airbnb. The actor’s dance card is full of Silicon Valley entrepreneurs courting his new investment arm, which he called A Grade. Kutcher recently invested in another startup SeatGeek. With Ashton on board, we’ll be working together to take our community engagement to the next level and expand our international presence to reach more people from different cultures all over the world. It’s an exciting time for us. Airbnb has pioneered an industry and broken new ground as a trusted community marketplace where people from all over the world can discover and book unique spaces from people anywhere in the world. Now it’s time to expand and time to bring our concept to communities on an international scale. Launched from humble beginnings, the company’s co-founders once sold special breakfast cereal in boxes that carried funky names (Obama O’s and Breakfast of Change) to attendees of the Democratic National Convention in November 2008 to keep the venture alive. Airbnb would go on to make a name for itself by matching frugal travelers with locals willing to accommodate them for a price. And while the site is often described as Couchsurfing for a more entrepreneurial crowd, it now also lists everything from igloos and teepees to castles, yachts and even the occasional private island. Take a look at a video interview we did with Airbnb founder Brian Chesky. Airbnb has a bright future, but aren’t we past star f*cking? I mean seriously. So a celebrity likes a company or puts in $50,000. Big deal. Big ups! I like the Airbnb concept a lot, admittedly it gave me a really good idea for a travel/tech/social company I am working on now. Also worth checking out Afar magazine (Afar.com) also form SF.